James Bailey Bassett, a 30 year old Cornishman, his wife Ann and their two young children arrived in SA on board the Diadem in November 1840. A third child was born soon after they arrived. After a few years at Nairne, they moved to Willunga and in 1847 opened a school in their newly built home Buckland House. On 31 December 1851 Ann Bassett died of consumption and was buried in the Willunga Wesleyan Methodist cemetery. James remarried in 1853, to Mary Murrell Farmer. Four children were born in the next five years, but only two survived infancy (Frederick Farmer Bassett and Charles Farmer Bassett). In 1862 James opened the Bassett Boys' Schoolroom which became the centre for many community activities in addition to education. James Bassett was involved in many activities in Willunga. In July 1850 he served for two years as Clerk of the Local Court at Willunga. He was a local preacher in the Willunga circuit of the Wesleyan Methodist Church and member of the congregation for some 30 years. 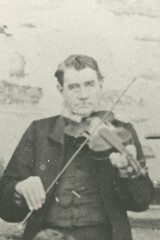 James Bailey Bassett was a musician who sang, played the violin, taught music and performed in concerts at the Oddfellows Hall, often playing a violin duet with his son or the talented young William Whitefield. The Bassett School’s fife and drum band provided music on many special occasions, as did the Willunga Band of Hope which James directed. James Bassett was a brilliant mathematician who created Magic Squares in which all rows, up down and diagonally, added up to the same number. He was engaged in a vigorous competition with a Mr. Catlow via the pages of the Register newspaper, each one claiming to be superior in creating the squares. At a Willunga Show in the 1870s he exhibited a monster magic square containing over 8,000 cells and 30,000 figures. At the age of 64, James contracted bronchitis and died after a short illness, being buried in the Wesleyan Methodist Cemetery. The Bassett Boys Schoolroom closed, with pupils transferred to Mr Noye's school which soon became the first Willunga Public school. Mary Bassett continued her private school at Buckland, without benefit of a Government license, but assisted by her nieces the Misses Nesbit. She died in 1889, aged 69 and was buried in the Wesleyan cemetery. 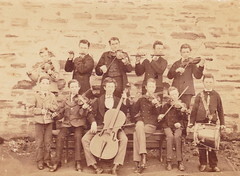 The Bassett family had strong connections through marriage to the other well-known Willunga families, including the Sara, Goss, Pounsett and Pettinger families. Do you remember Bassett, James ? Then Join up and add your memory here.